Today there is increasing demand for granular fertilizers which have a favorable appearance. One of the more obvious appearance differentiators is color, and so fertilizer producers need solutions to impart the desired colorations the market demands for their products. 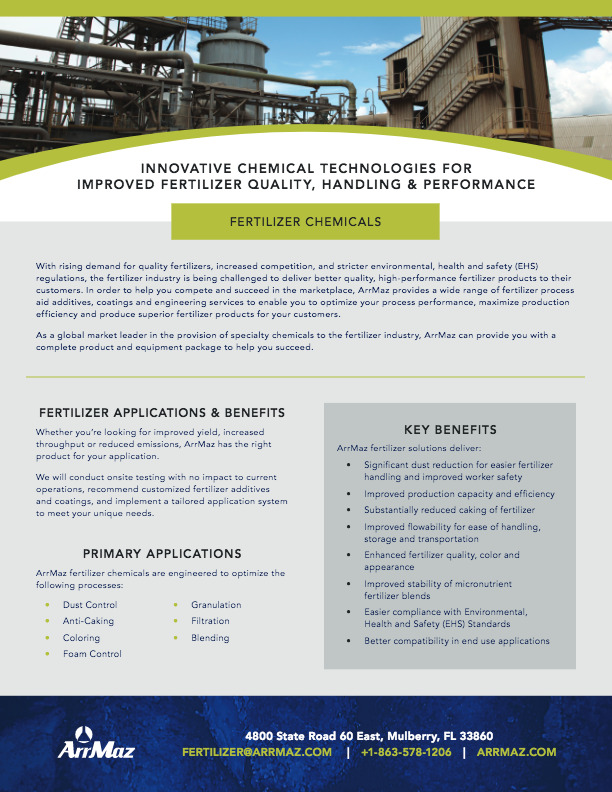 ArrMaz has developed a broad range of coloring agents based on dyes and/or pigments to treat the entire fertilizer granule from the inside out, including color coatings which can further modify the color, sheen and translucency of the granule surface as desired. In addition, ArrMaz’s DUSTROL® and GALORYL® coating agents, which also contribute dust control and caking control, can be customized to impart color to the surface of the substrate. Our research scientists, with the help of our field technicians, can diagnose and prescribe the appropriate colorant, coating agent or, in some cases, a combination or package of multiple coloring agents to achieve the desired result for our customers. ArrMaz also designs and installs optimal application systems for our coloring agents. These application systems can be designed to include colorimeters to detect subtle changes in shade and intensity of the colored fertilizer and to synchronize these detection devices to dosing controls in order to maintain consistent adherence to color specifications.